In order to offer a Ram truck with diesel, there will be a new engine, and one not from Cummins. It will be coming from VM Motori of Cento, which is an Italian company owned by Fiat. The 3.0-liter V-6 turbo diesel engine will be in the 2014 Ram 1500 and later made available for the Jeep Grand Cherokee. The actual specs of the Ram version have not been made available as of yet, but a comparison is drawn using the Grand Cherokee. In the Jeep vehicle, the engine is capable of 240 horsepower and 420 lb.ft of torque. The Ram specs should be revealed sometime this summer. 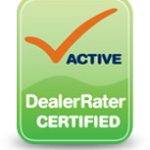 Bayside Chrysler Jeep Dodge offers the Queens and Manhattan areas top quality customer service. Whether it’s to purchase a new or pre-owned vehicle or to bring in your current car into our service department, be assured you’re working with the best. Like us on Facebook and follow us on Twitter for more Ram news and to see our monthly specials. 2013 Ram 2500, 3500 Heavy Duty & Chassis Cabs Revealed! As promised, Ram Trucks rolled out the future of the heavy duty truck last week. 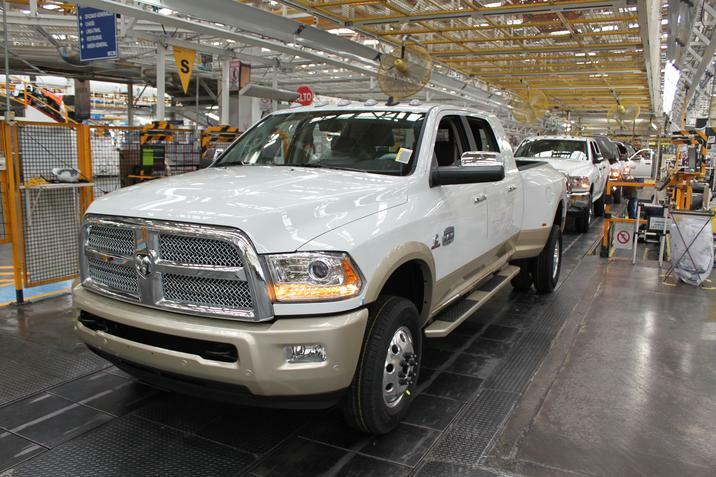 Surrounded by a range of truck enthusiasts, from journalists to the truck-loving consumer, Fred Diaz, President and CEO of Ram Truck brand, pulled back the curtain and introduced the world to the new 2013 Ram Heavy Duty 2500 and 3500 pickups, and the Ram 3500, 4500, and 5500 Chassis Cabs. 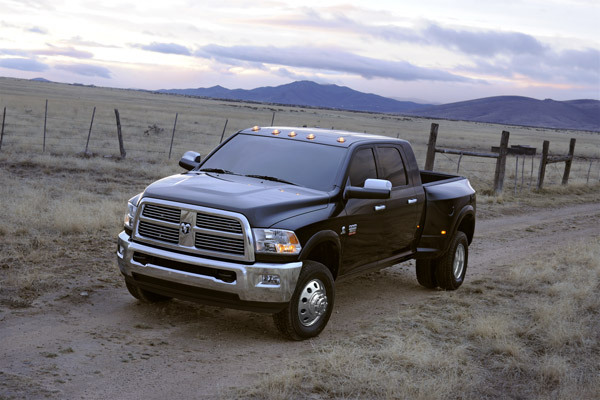 The 2013 Ram 2500 and 3500 Heavy Duty trucks come with the promise of the kind of power that truck owners are looking for in the brand. For the first time ever, the 3500 will be offered with a 5.7-liter HEMI V-8 and a Cummins 6.7-liter High-Output diesel as standard. Both the Heavy duty and Chassis Cab models will come with an electronic stability control to help reduce the loss of traction as standard on all Ram truck models. There will be plenty of colors to choose from, including fresh new ones and material upgrades for the truck’s interior that will be part of a new individualized themes Ram is going for. Also included in the mix will be the 8.4-inch Uconnect system that is so popular in Chrysler vehicles. The future is bright for truck lovers as Ram aims to offer the best in the business to buyers. If you’re a Ram fan, or someone who has been wondering what all the talk is about, it’s a good time to be on the look out for a truck. You can view the entire Ram line-up online at Bayside Chrysler Jeep Dodge’s website as well as see our new and pre-owned inventory. Be sure to like us on Facebook and follow us on Twitter for more Ram news. 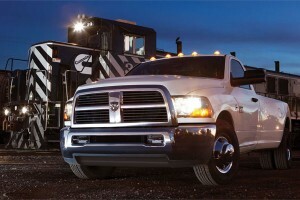 Just one look at the powerhouse that is the Ram Heavy Duty Truck shows why it’s considered a legend in its class. It’s a clear sign in its design that it’s all about strength in form and features. It all begins with the big rig styling. With both the Ram 2500 and 3500, these trucks look to do more than impress you with numbers on a sheet of paper telling how much they can carry. 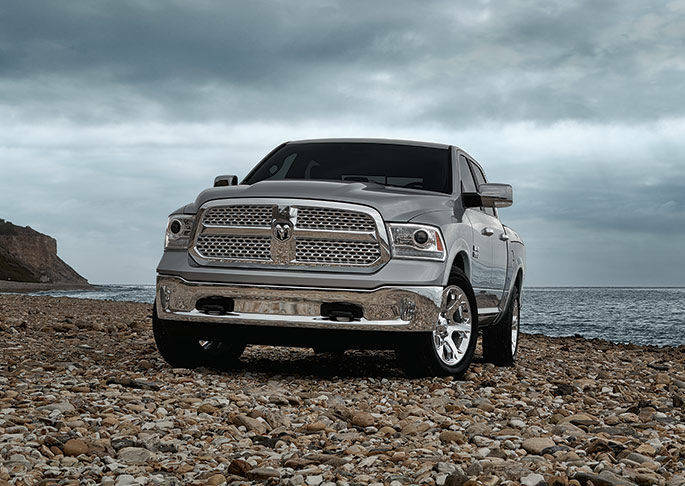 The most obvious aspect of the exterior is the signature Ram grille which comes in either chrome or the body color. The steel and detailed hood with louvers on each side is used to hold in the possible engines. It uses a cowl screen that allows the airflow to have a smoother transition when traveling from the hood to the windshield. For added uniqueness to the Heavy Duty Truck, you can purchase a Mopar aluminum running boards to not only give additional style but also give easier entry and exit from the cab. The engine contained within the Ram 2500 is the 5.7 liter HEMI Magnum that has 6 speed automatic transmission and 383 horsepower at 5600 RPM. For the Ram 3500, you have the 6.7L Cummins Turbo Diesel, considered by many to be a staple for its unrivaled power and the ability to tackle the toughest of jobs. It has 350 horsepower with 800 pounds of torque showing how it earned this status. For the 2012 models of the Heavy Duty Trucks, in an effort to lower costs and give hassle free maintenance, Ram includes a class-exclusive NOX Absorber Catalyst. What this system does is regulate diesel emissions in line with EPA standards. You won’t need to worry at all about having to monitor your diesel exhaust fluid because of this. If you’re worried all this was efficiency came at a sacrifice of comfort, don’t worry at all. The Ram 2500 and 3500 were made to be driven. The Laramie Longhorn Edition has something very unique in the form of laser-etch stitching on the leather. For the person who takes the Ram Heavy Duty to the job, the seat fabric is designed to be stain, odor, and static resistant to make sure that you have a quick and easy cleanup when the day is done. An added bonus that its effect doesn’t diminish with time. Other bonus features are a heat steering wheel, dual zone temperature controls, and soft-touch instrument panels. It’s all done with exemplary craftsmanship and care. Ram wants to make sure that you’re protected driving to work or for the family by having 25 different safety and security features. Both the 2500 and the 3500 come standard with a set of advance multistage airbags, from the driver and front passenger to the side curtain ones. In addition to that, the safety cage of the trucks are built to endure punishment. This is because they have dynamic front crumple zones and beams built into the doors for side impacts. All this helps to deflect and absorb forces of an impact should an accident occur. Another highlight of purchasing a Ram 2500 or 3500 for yourself is the Ram has ensured that these trucks are built to last. Durability is a word that means something to the design team, one that they made sure to test rigorously. That means that whatever your Ram Truck is meant to do, be it your choice of work vehicle or just getting the family to the Adirondacks, it’s going to spend more time on the road than in the shop. In order to make that claim, the testers at Ram have put the trucks through their paces in tests that range from 120 degrees for a desert and -20 for arctic climates. The models also include corrosion-resistant hydro formed frames. 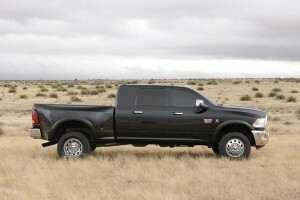 The Ram 2500 or 3500 will be with you for a long time. The truck for the heavy duty worker is here in the multiple form of the Ram Chassis Cab with the Ram 3500, 4500, and 5500. All are available to help anyone who needs to get the job done and wants to do it with style and strength. The exterior sports a rugged design that plays to an observers eyes while still making sure to show that this is a Ram Chassis Cab and is made for business. It all starts when the wandering eye finds the grille, it’s the signature Ram Truck grille that’s famous for its design. If you want it to jump out even more, then it comes in chrome. The next jump out part is the louvered hood that keeps the truck both ventilated for the engine and aerodynamic to keep a solid fuel economy. The most apparent part in the trucks design is the flat stop surface of the frame design. This flat top surface makes it so the need for spacers is reduced and makes installation easier. For anyone looking to buy for business, the cherry on the top of this truck is the available color schemes to aid in any business needs, be it for construction or a landscaping service there is a color for it. 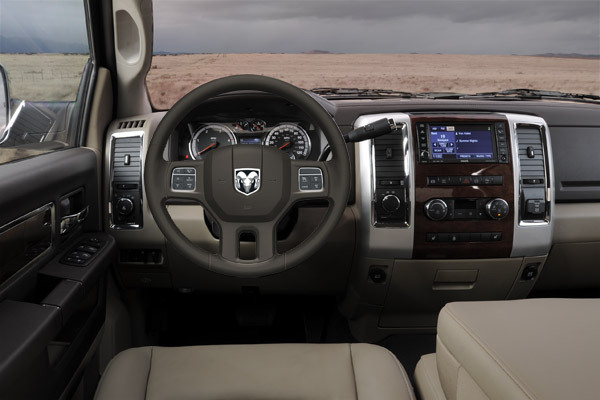 The best part about driving away in a Ram Chassis Cab would have to be that the interior is perfectly crafted to allow for maximum comfort in a truck built for performance. The dashboard is built with soft-touch materials and this extends to the armrests. The command center of the truck is proudly displayed on the instrument panel with items such as fuel and battery level all surrounded by a stylish chrome ring. Another amazing feature that was just added to the Ram Chassis Cab is the class exclusive heated steering wheel for those tough jobs on a cold winter day. For a more relaxed ride, the trucks come available with the Laramie premium leather seating. Heating is available to make a sweet deal even sweeter. Another added perk for the working man is the fabric used in the seating that is designed to be resistant to stains, odors, and static. 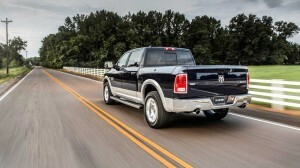 A Ram Chassis Cab wants to make sure you have the furthest travel without the need to gas up. With this is mind, a standard 52 gallon fuel tank is in it’s trucks giving the best-in-class single fuel tank capacity. If that’s not enough then there’s an easily accessible auxiliary fuel port for auxiliary fuel-driven power sources. 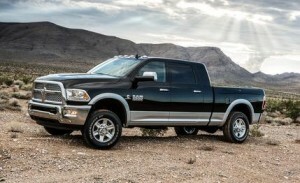 Then there’s the fact that with the Ram 4500 and 5500 with the Cummins Turbo Diesel engine that Ram is the only truck manufacturer to offer a 50-state emissions package that allows driver to be idle without worrying about the time restrictions in ARB (Air Resource Board) states. 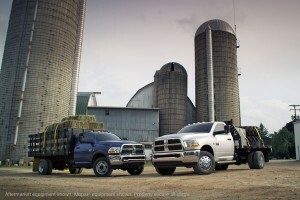 Speaking of engines, the Ram Chassis Cab comes with 2 possible choices. The first is the 6.7 liter Cummins Turbo Diesel that was mentioned earlier. It has a horsepower of 305 and 610 lb-ft of torque. This engine has a six speed manual transmission and six speed automatic. The other available engine is the HEMI V8 5.7L. In contrast, this one has 383 horsepower and 400 lb-ft of torque with a six-speed automatic transmission. This means it has the best in class horsepower. Both of these engines are out to make sure that you have the most power no matter what job you’re on. The Ram Chassis Cab comes complete with numerous features designed to add convenience. For starters, there’s the electronic vehicle information center, which turns the truck’s cab into a commando center. From here, the dashboard read outs give the driver every vital piece of information you will need to ensure the truck is running smoothly and properly. It will display the engine coolant/transmission/ and oil temperatures, average fuel economy, the DEF (diesel exhaust fluid) warnings, and even outside temperature. 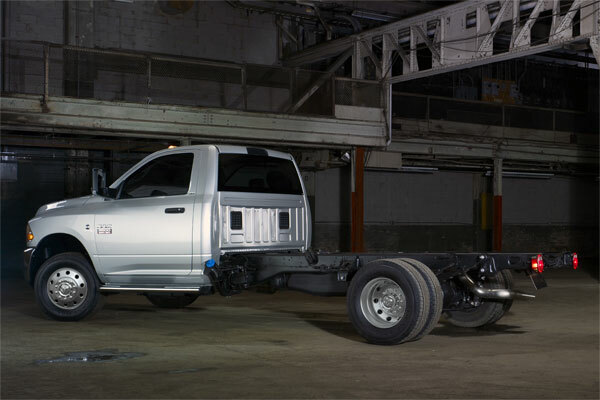 The Ram Chassis is all about making sure you’re constantly aware about what is going on with the truck in order to make sure you can take care of any issues before they become a problem. The Chassis is built to be strong on the road and with any load, but it’s also made to be sure to stay safe. It all starts with the safety cage that has crumple zones and side door beams built into the body cage that provides structural safety. These points absorb the force of an impact in a controlled manner that makes sure to keep the integrity of the cabin if an accident does occur. This is also aided by the fact the Chassis has dual front impact airbags and ABS brakes. No matter what’s being hauled, you’ll be safe behind the wheel.